Want to wow your friends, impress the teens, and be known as the best gift-giver in the family? 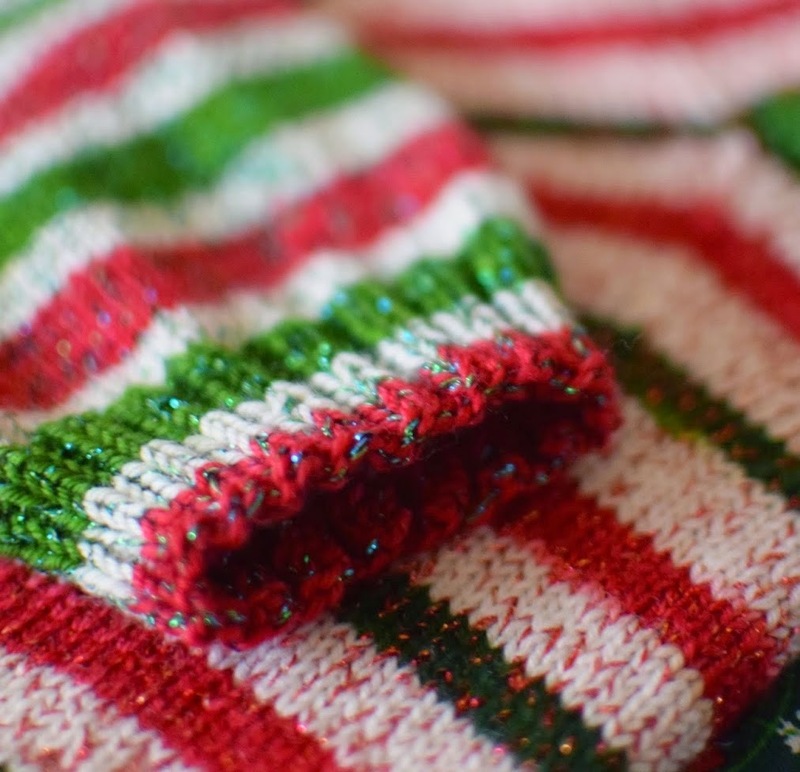 Take a cue from knitting designer and teacher Susan B. Anderson and make some tinsel socks. Too late for gift-giving this year? Start making a pair a month in 2015, and you will have next Christmas' projects finished already. 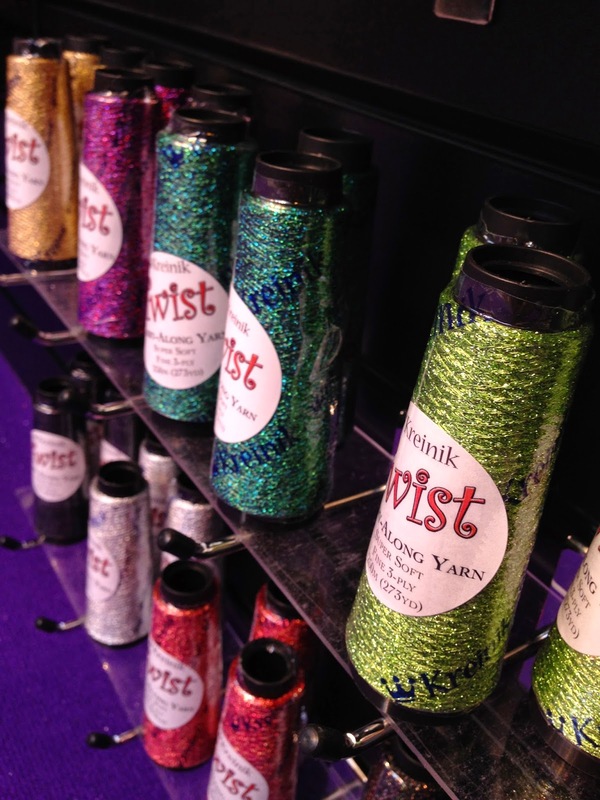 It's easy: just add Kreinik Twist to any yarn (stash-buster!). This is a super-soft metallic carry-along we make in our West Virginia factory. Susan used two Twist colors in these fabulous striped socks, which seem to capture happiness and the holidays plus comfort and joy all in one (or two, one for each foot). She used Kreinik Twist 273 Red/Orange and 339 Teal. The metallic makes any knitting pattern a party-in-a-sock, plus it's practical: soft (= happy feet), washable, and dry cleanable (if you are into dry cleaning your socks). Twist is a softly variegated thread, made up of two or more colors, so the hues give a lovely depth to your base yarn and almost literally dance in the light. Susan offers this expert advice about the Kreinik Twist carry-along: "The thread I'm using is called Twist and it doesn't change the gauge at all for knitting when carried along with your yarn. I have been asked if it is scratchy and the answer is no. The thread is not scratchy at all but it does change the texture of the knit fabric slightly. It is remarkably still soft considering the addition of a metallic thread." 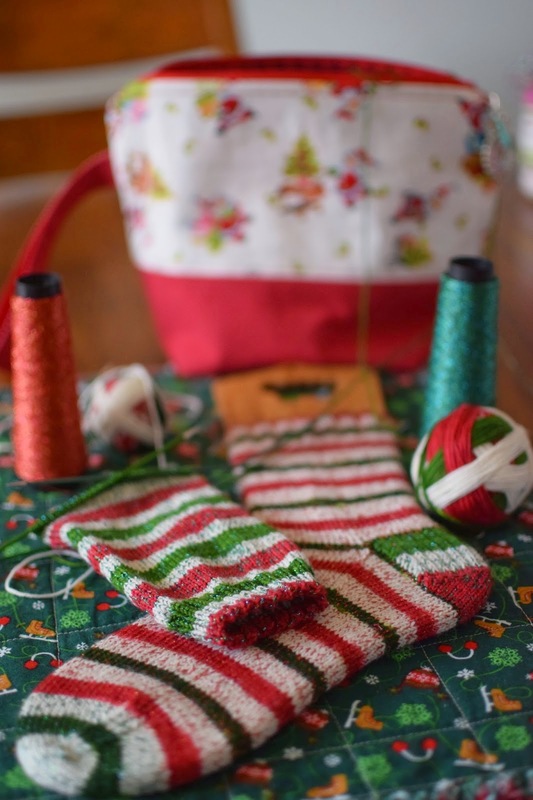 Check out Susan's blog featuring her Tinsel Socks here: http://susanbanderson.blogspot.com/2014/12/tinsel-socks.html. Her blog post also includes a link to her free sock pattern. May your holiday socks be merry and bright. Deck the halls with handmade treasures this holiday season. What to make? Pick one or more of the colorful and quick free project ideas from Kreinik. 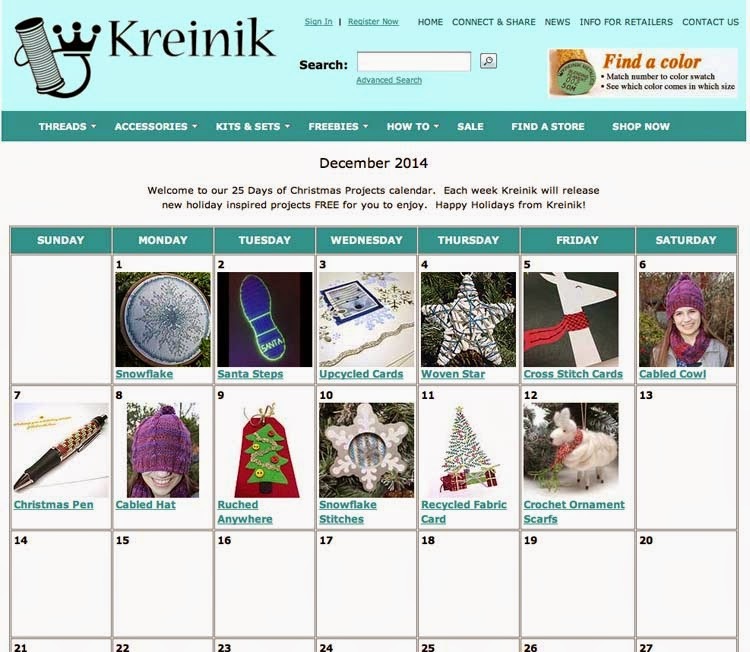 Our 25 Days of Free Christmas Projects calendar is on the Kreinik website, featuring crochet, knitting, cross stitch, needlepoint, kid's crafts, paper crafts, and more. Each project is designed to use one to three Kreinik thread colors, and to be made in short order (we know how busy everyone is this time of year). And we've designed them to be low-cost on finishing: many of the cross stitch or needlepoint designs can be finished using ornament frames found at craft stores and discount stores this time of year. There's even a few dollar-store transformations you have to see to believe. Visit the 25 Days of Free Christmas Projects calendar now, and bookmark it to check for design additions. Happy holidays from Kreinik! Make it a colorful, shiny, creative New Year.